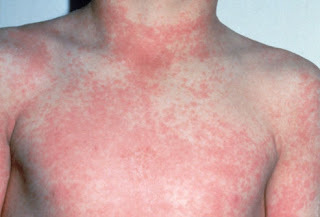 DRESS (drug reaction with eosinophilia and systemic symptoms) is a poorly understood syndrome that has an unknown prevalence in the pediatric population because it is often missed by doctors. Symptoms include fever, an itchy rash covering over half the body, enlarged lymph nodes, and inflammation of the liver. A blood test reveals increased white blood cells, "atypical lymphocytes" (abnormally large and irregular lymphocytes because they are infected with the virus), and elevated eosinophils. What causes it? There have been links to both herpesvirus (including oral and genital herpes, epstein barr virus and roseola virus) and a couple months after starting certain anti-seizure medications. Bad cases will involve >90% of the skin and affect multiple organs such as the kidneys, and there may be involvement of the mucosal lining of the mouth and lips which can mimic life threatening drug and infectious reactions known as Stevens Johnson Syndrome and Toxic Epidermal Necrolysis. It is very difficult to avoid getting this syndrome, as it is unknown why some patients get it and others do not. It can take months to fully recover from DRESS syndrome. The treatment, if caused by a medication, is to stop that medication. Most patients get IV or topical steroids to calm the immune system. Most often, pediatric rashes are harmless. In rare cases such as this, however, some detective work is required to make a swift and proper diagnosis.